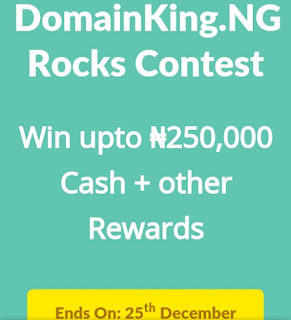 “DomainKing.NG Rocks Contest is now LIVE! Don’t miss your chance to WIN Cash Rewards upto ₦2,50,000. The winner of the 1st prize will receive the CASH REWARD of ₦ 1,00,000 Who wins the 1st prize? The person with maximum services purchased and maximum shares done will be rewarded the 1st prize. Buy/Renew any service i.e: Domain Names, Web Hosing & SSL during the contest period & Share/Tweet this contest as many times as you can. The winner of the 2nd prize will receive the CASH REWARD of ₦ 60k Who wins the 2nd prize? The person with 2nd highest number of aggregate services purchased & posts shared will be rewarded the 2nd prize. How do I win the 2nd prize? Buy/Renew any service i.e. Domain Names, Web Hosing & SSL during the contest period & Share/Tweet this contest as many times as you can. The winner of the 3rd prize will receive the CASH REWARD of ₦ 25k Who wins the 3rd prize? The person with 3rd highest number of aggregate services purchased & posts shared will be rewarded the 3rd prize. How do I win the 3rd prize? Buy/Renew any service i.e. Domain Names, Web Hosing & SSL during the contest period & Share/Tweet thiscontest as many times as you can. hosting service will enter you in the lucky draw to win. So the more you buy during the promotion period, the more chances you have to win! 1. Buy/Renew any service i.e. Domain Names, Web Hosing & SSL during 21st Nov 2016 – 18th Dec 2016 & share/tweet this contest as many times as you can. 2 Like us on Facebook , Google+ & Twitter . 3 SHARE & TWEET this offer MAXIMUM TIMES with #DomainKingNGRocks in your posts. 4. 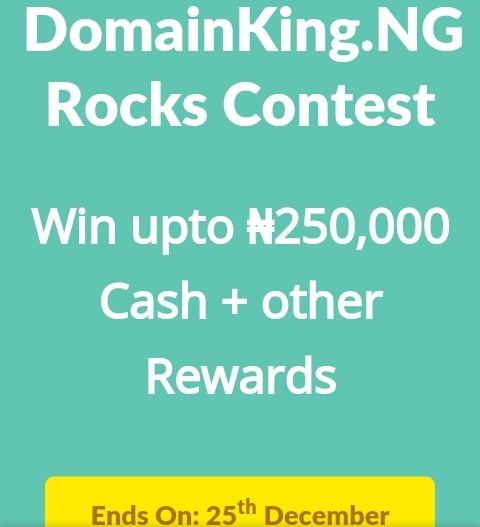 Mention DomainKing Rocks contest on your Blog post, Facebook post & Twitter post. DomainKingNG has practically divided Nigeria into 2 (in a good way) and built it back in 3 days. Lol. Mr. Mathias, have the winners been announced?